Always high quality stuff, now an industry standard. The early frames looked like a hutch, with an extra bar. I recall Eric Rupe & many other racers on their team. They are still popular today in all areas of cycling, including downhill specific bikes, street, dirt jump and race specific bikes & high quality parts. Made in the USA. The longevity of Profile Racing in this Industry can be attributed to its innovative product development, its contribution & support to the sport &, the true dedication of its very talented employees. 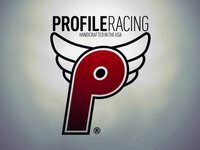 Still, to this day, Profile Racing products are 100% made in the United States of America. Buy American!